Manipulating seach results is something most SEO’s think about their own sites. But as brands grow, so do conversations about them; reviews, mentions, even entire Websites are sometimes built to dog or deter new customers from doing business. These sites can be as influential for a purchase decision as your own site. While the best defense to negative posting is to always keep customers happy, your second best line of defense is to dominate and control as many of the Top 10 Search Results possible. In this post, I’ll outline the strategies I’ve tested and implemented to make this happen with the least amount of effort. This is a story of online branding. It’s a story about SEO, and it’s a story about link building and reputation management. And, it’s a story about the downfall of my impostors. There aren’t a whole lot of Lefevers out there, especially where I live. In my immediate family, I’m the last male, so it’s up to me to reproduce new little Lefevers to keep my name rolling. When we think of SEO, we usually think of our own Websites. But in this exercise, we’re also interested in leveraging everyone else’s Website about us or who talk about us in positive light. 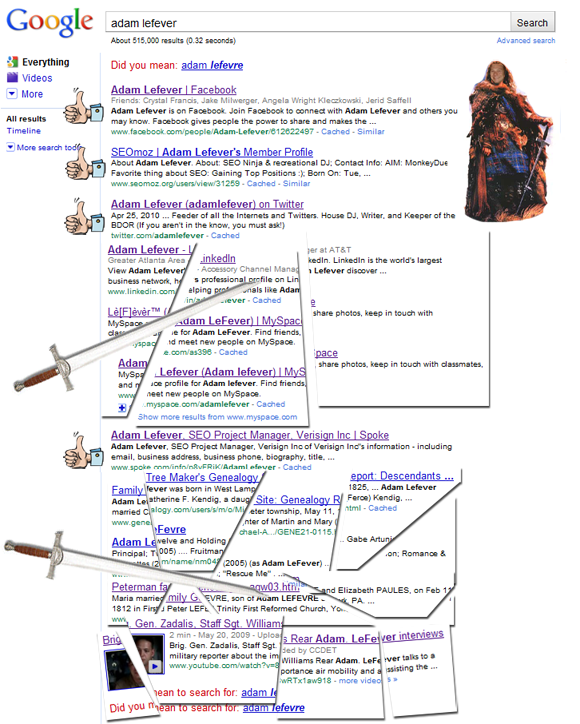 Search through the Top 50 SERPS and find every mention of you, both positive and useful. Then, take note of every competing result you don’t want to show. Right now for Adam Lefever, I’ve got about 4 of the Top 10 (where, shamefully, Market Misfit does NOT appear yet). The results are my Facebook account, Twitter account, a Video result, Spoke page and something I posted to SEOMoz a long time ago. The other 6 results are about my imposters. Looking deeper in the Search Results, I find a lot about the “Actor” Adam Lefever, including a Wikipedia Page (which, I realize, it would help for me to be marginally more popular.) and a few more things about me. Down to Page 5, I find only a couple more results about me. So with a Blog and some second page results, this means I’ve got some work to do. Let’s get started. www.linkedin.com/pub/dir/Adam/Lefever – #46 – Not directly about me, but still shows my face. Above are the best 7 results that somehow connect to me, so I’ll want to build some links to these locations using my name and start with the 2nd page results first. Here’s the Tip of the Day: This demonstrates why SEOs should use Social Media for two reasons. Reason 1: You control these pages, and they’ll appear in the Top 10 for your name or brand. Reason 2: These domains carry some serious weight in Google – your presence there is almost a guarantee you’ll get your stuff crawled by GoogleBot. Here’s the Second Tip of The Day: If you have a business, you’ll want to get into the Local Business directories as well. CitySearch, YellowPages, Better Business Bureau, etc. all build pages about you Google will index. Since these contain reviews, you’ll want to watch them carefully and respond to them if needed. Now that I know the URLs of my existing rankings, I’ll want to start with them first. Log into each of these accounts to update and correct any incorrect information. Add a link to your Website, Twitter, Facebook, etc. to cross-link them. Throw in a couple instances of your name if you can, links to your blogs, etc. Change any Headings, Content, Title, or Description to include your name/brand. Anything on Page 2-5 may only need a few links to push it to the first page – and in the process, pushing down all of the other results. Find all of the positive Search Results and start building links to those pages with your name in the anchor text / ALT Tags. It’s time to promote the hell out of your stuff. Always use your name/Brand in the Anchor Text of the link. Make it “Official” to Google’s eyes. Anything you submit should have your name/brand tagged. Cross-link your blog and profile pages. Build new social networking pages. Submit a few articles with optimized links. Post several Tweets and Facebook updates. Create an RSS Feed out of the pages and submit to RSS Feed engines. Google also links to Videos, Photos, Shopping Results. There’s even a video result for Adam Lefever. So, I’ve got a little bit of competition here too. I also noticed my unkept and rarely updated Adam Lefever YouTube Channel isn’t appearing in the Search Results. But why not? Well, for starters, I need to Optimize it with my actual name. 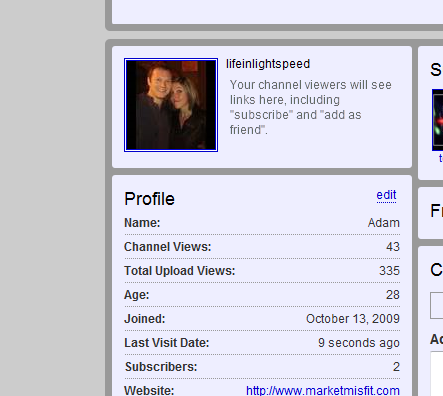 My username is “LifeInLightSpeed”, not “Adam Lefever”. I particularly like this alias, so I won’t change it, but I can certainly add my name in my Profile Name and sign the “About Me” section with my first and last name. In the near future, I’ll produce an optimized Title/Description/Tag video about myself to compete with this video result. Thanks for Reading – I hope this post has inspired your thinking!